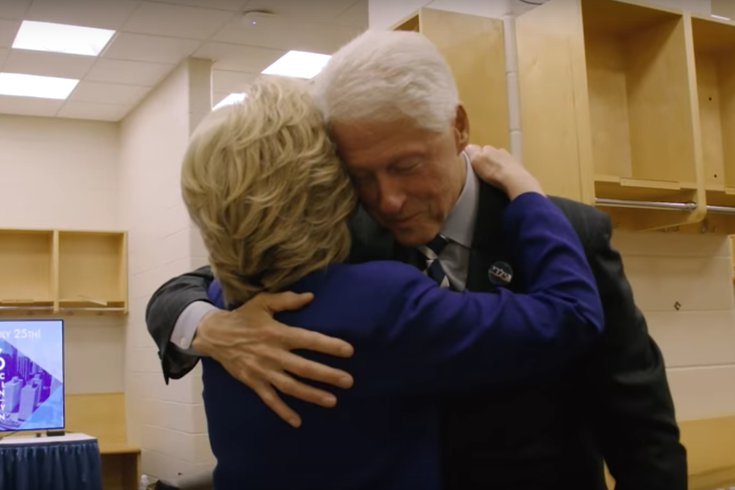 Hillary Clinton and Bill Clinton share a hug backstage at the Democratic National Convention. Television networks captured all the big speeches last week at the Democratic National Convention. But what was happening behind that huge, blue stage at the Wells Fargo Center? The Hillary Clinton campaign offered a glimpse in a short video posted to YouTube on Thursday. The footage captures various personal interactions between Hillary, former President Bill Clinton and President Barack Obama, among other politicians and celebrities. Naturally, the video features Hillary in the moments before, during and after her historic acceptance speech. But it also captures Hillary chatting with Katy Perry, Obama bobbing his head to Eminem's "Lose Yourself" and Vice President Joe Biden winking to the camera. Yet, somehow the video failed to showcase Bill Clinton playing with balloons.